Minimum Wage Tracker, EPI “The federal minimum wage has not been raised since 2009.” That increase was mandated by a law passed in 2007. Effects Of Minimum Wages On Population Health, Leigh & Du, Health Affairs, 10/18 New research indicates that an increase in minimum wages can have important health benefits—a finding that is relevant to public debates about both health and economic policy. “An estimated 2.8 million employees will get a raise on Friday [7/24/09] as the federal minimum wage rises from $6.55 an hour to $7.25. Another 1.6 million whose hourly pay hovers around $7.25 are also expected to get a boost as employers adjust their pay scales to the new minimum. The raise is badly needed. It is also wholly inadequate. 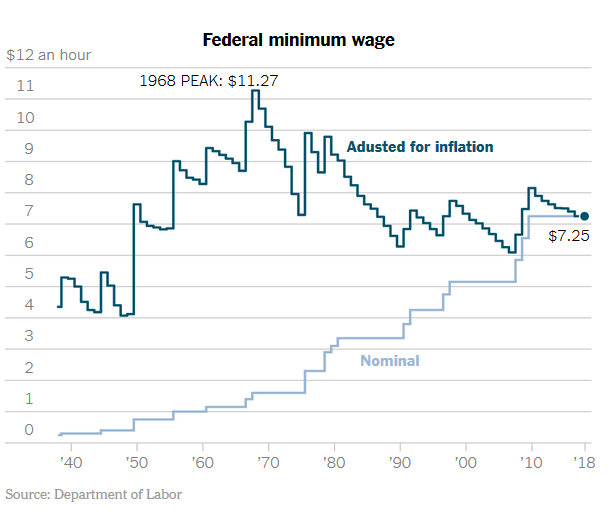 With the latest increase, the minimum wage is still no higher now, after inflation, than it was in the early 1980s, and it is 17 percent lower than its peak in 1968. 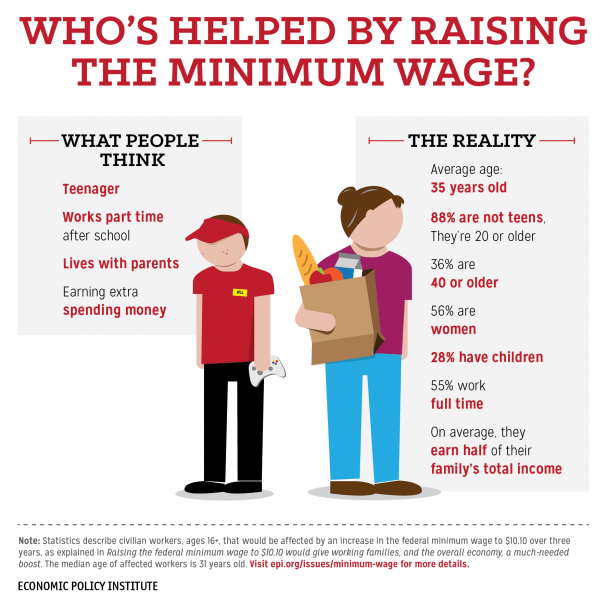 That means that no matter how hard they work, many low-wage workers keep falling behind. The latest increase will slow the decline in living standards, but it doesn’t reverse the overall downward pull. 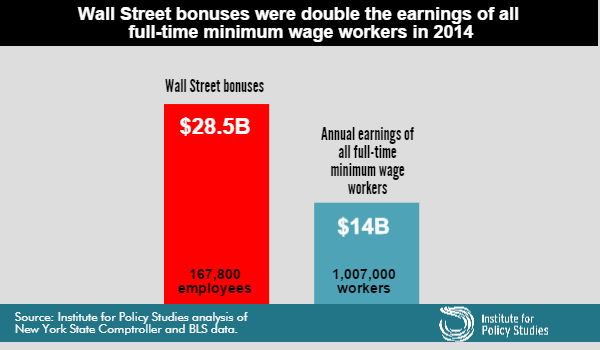 Even that understates the broader dimensions of the problem.The minimum wage also sets a floor by which other wages are set. Keeping it low keeps wages lower than they would be otherwise, especially for jobs that are just above the minimum-wage level. That’s a big problem for American workers because low-wage fields are the ones that are adding the most jobs.